We are, all of us, unimaginably small. Our entire planet, everything that we are as a species, all of the plants and animals that make up our world, our entire biosphere is infinitesimally small. While our world and our civilization and our individual societies and their attendant squabbles are profoundly important to us, their importance is purely relative - in any sort of cosmic scale, they dwindle into utter insignificance. 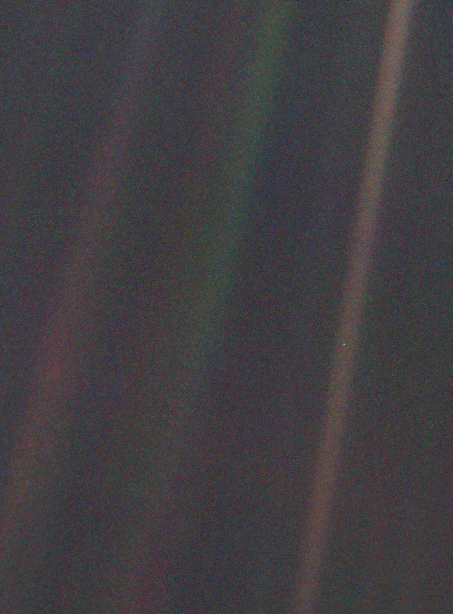 Carl Sagan, discussing the first picture of Earth taken by the Voyager 1 spacecraft as it passed Saturn described Earth as "a mote of dust suspended in a sunbeam." Few quotes have ever been more apt. If you look closely, in the sunbeam to the right, you can see a single pixel, a single point of light. That is our planet as seen from three planets away. This is a picture of our planet from within our own solar system, about 6 and a half hours away if you're travelling at the speed of light. Even at this incredibly close cosmic distance, our planet dwindles to utter insignificance. A single point. Little more than an aberration in the background of blackness. From the nearest star, over four light years away, our planet would be utterly invisible, detectable only by the way its gravity tugs at the Sun or obscures a tiny fraction of its light as it passes by. Even when viewed from our closest celestial neighbors, we are incredibly small. Viewed from any further vantage point, we dwindle into utter obscurity. Theists have posited the theory that the Universe is 'Finely Tuned' to foster the formation of intelligent life, that the physical constants that underlie the fabric of space, time and matter are so finely balanced that it is somehow evidence of some kind of intelligent authorship, that it is evidence of God. This is utter rubbish. This anthropocentrism, this arrogance, this narcissism, this persistent belief that WE are somehow the center of the Universe, the purpose of the Universe is obscenely conceited and utterly, hopelessly backwards. The Universe is not 'Fine Tuned' to generate beings like us, WE are fine tuned to live in the Universe as it exists. Our biology is adapted to the physical constants that exist. The physical constants are not designed to generate us. It is undoubtedly true that if the Universe were other than it is, beings like us probably would not exist. To argue that other kinds of beings, however, other formations of matter or electro-matter or anti-matter or what not would not or could not form, is utterly baseless. We are merely a small part of the Universe. A single spore floating in the void. Even assuming that some manner of entity created all of this, what kind of conceited, arrogant, narcissist could possibly believe that WE are worthy of its attention? That WE are worthy of its companionship? That WE are worthy of a personal relationship with it? As I describe in great detail in the Great Chain, the difference between such a being and ourselves is far greater than the difference between me and a single bacteria. To be sure, such a being COULD do whatever it wanted, but to believe that it is probable or even plausible that such a being would have the slightest interest in beings such as us is laughably silly. And so what? So what if the Creator of the Great All isn't interested in us? Who cares? We are what we are. We dwell on the level of existence that we dwell on. And within that level, within our glorious cosmic insignificance, we have done amazing things. We have created wonders that surpass anything previous generations have ever dreamed of. We have created societies that value peace and freedom and personal autonomy. Imperfect as we may be, our civilization continues to progress, continues to evolve, continues to grow and thrive. And so what if we are insignificant in a cosmic sense? Who cares if God doesn't want a relationship with us? We don't need him. We don't need him for companionship, or comfort, or meaning, or morality. We have each other. We have friends. We have lovers. We have laws. We have society. We have our beautiful, amazing, living, breathing, breathtaking world. And we have a glorious future. Theists often confuse meaning with cosmic importance. The reality is that meaning is not something that is derived from without, but something that comes from within. So revel in your cosmic irrelevance. Revel in your humanity. Revel in who and what we are - in our glorious insignificance. That is one thing that made me question religion and god in the first place was how small we are in this big never ending universe. This puts a lot of explanation to some of the thoughts I have had. As for the debate of humans progressing and evolving, that's a hard one. It seems for every way we progressed or evolved in some other way we took a few steps back. But not like I know that much anyhow...but I am learning more everyday. Thanks for the blog I enjoyed the read. I cant see the glass. You see a waterfall. Somewhere twixt lies a defensible position. I don't mind. I actually see the recency of much of our evolutionary progress as proof that we are in fact advancing. We have overturned millennia of barbaric practice of slavery that was (and still is) explicitly sanctioned by religion and within two centuries it has gone from a nearly universally accepted practice to one that is universally reviled. Jeffrey, I second your existential utterance. But I maintain that our civilization has not really progressed or evolved. Much of the rights that you see as progress are won after bloodshed and class conflict. It is truly sad when one contemplates how recently slavery was flourishing and we point to its cessation as proof of progress. Our backward looking civilization is of course produced by and a reflection of religion and we cannot truly advance until we become anti-religious and secular. Thereafter we have to replace religious values with rational values such as egalitarianism, equality and compassion. And we need to act on those values fervently and never turn a blind eye at another genocide. We should root out racism and all of the absurd forms of discrimination. etc. Technology spins out of control while the majority of humans approach life in the same way as their ancient ancestors. Flush religion and we have a chance as a species. Even then I would not count on our species longevity or progress that is truly satisfactory. Ok PANGLOSS, sorry I revisited this issue. The devil made me do it.